We are super excited to announce the launch of our Royal Mum feature, where we will be posting interviews of our favourite mums, products and services. We could not think of a better way to introduce our features than with a real Royal Mum, Lady Julie Montagu. If you want to meet an inspiring mother look no further than yummy mummy Julie Montagu. Julie, not only a mother of 4 is also a yoga instructor, health coach, book writer, former model and has recently graced our screens in reality TV’s “Ladies of London“. With a body to die for, striking green eyes and a smile that can stop anyone in their tracks, we were eager to find out how she manages to maintain that glow and manage her family. RM: Tell us who is Julie Montagu? JM: Originally from Sugar Grove, Illinois in the USA – I come from a VERY small town in the Midwest of America, middle child of 5, and even went to the same high school as my parents! RM: Being a yummy mummy of 4, a yoga instructor and a holistic coach and launching your book Superfoods, the list is endless… how do you manage your time between work and family? JM: People always assume that I have help.. and actually I don’t! When I was growing up with 4 other brothers and sisters, my mom did it all. And so, I think it’s just what I know – to just do it yourself and then you don’t know any better or different! I do most of my work while my kids are at school and that includes writing, blogging, cooking, teaching yoga, meetings etc. and cycling to and from across London. And then once my kids are back home, I’m there to make the supper, help with homework etc. and the nights when I teach in the evenings and my husband is away, my amazing 16 year old daughter looks after her 3 younger brothers. ( I do pay her babysitting money though! ;-)) But I’ve actually found that cycling everywhere I can, really helps my mood! Increasing the endorphines as much as possible so that when I arrive at my destination, I”m actually genuinely in a good mood. RM: What inspired you to lead a healthier lifestyle? JM: I was EXHAUSTED after my fourth child was born. I found that my energy levels were depleted nearly every single day and I became moody, angry and certainly not fun to be around. And so, the first thing I did was to ditch the coffee which was incredibly hard at first, but once I got over the initial shock of being off coffee – I started actually feeling better. And then I could do more, one of which was yoga. I honestly believe that yoga weirdly saved me from my moody self. And from yoga, it’s just a natural progression into a healthier lifestyle because that’s what everyone was talking about before and after classes. I started to pick up on new foods to try, foods to give up and once I started adding in the ‘good’ stuff, my body started to naturally not crave the ‘bad’ stuff. RM: If you could give words of encouragement to mothers out there to lead a healthier lifestyle what would you say? JM: Do ONE thing a day for you. Whether that’s a walk, a run, some yoga, a green juice, meditation – do something that your future self will thank you for… every single day. It works. It’s wonderful to give back to yourself as a mother after giving so much to everyone else. RM: What tips would you give to mums who want to introduce a healthy diet into their lifestyle? JM: Take a short course online or follow some of the amazing blogs out there or read some the new books on healthy eating and lifestyle that have just hit the market. The wellness world is buzzing now! I can barely keep up but it’s all so fascinating! My husband and I created my first Online Nutrition Course at http://www.theflexifoodie.com which is a short course, affordable and really does introduce you to a healthy diet for the rest of your life. We created this b/c there was a gap in the market for these kind of short courses – some of us don’t have time to study over the next 2-3 years especially when having young children! RM: What advice would you give to mums to be on keeping healthy during pregnancy? JM: During all 4 of my pregnancies, I did yoga and swam nearly every day. But again, I really think it was the yoga that helped me not freak out or stress especially during the last trimester. I carved it out in my diary and religiously went to class. Yoga really helped me stay positive and happy. RM: As mothers of active children, the only thing that keeps us going is caffeine, what do you recommend that we could drink to replace that? JM: My view is that there’s caffeine and there’s caffeine…. The caffeine from coffee is STRONG and the coffee is ACIDIC. Not the best combination. Years ago I swapped that coffee for green tea. Yes, it still has a bit of caffeine but a bit isn’t bad! Especially when green tea is alkaline. When we drink the acidic coffee it causes us to crave more acid foods during the day whereas drinking the alkaline green tea, helps us crave more alkaline foods and improve our overall eating habits. And the benefits of drinking a good green tea are MANY! RM: It was great to see you in the TV Series ‘Ladies of London’ last year… will we be lucky enough to see you again in the show? RM: Being an inspiration to mothers, managing a family and a successful career, who inspires you? JM: Hands down, Debbie Ford. Sadly she passed away recently but she was such an inspiration to me over the past few years in terms of motivating, self-esteem, self-confidence – so I still listen to her lectures quite a bit and have all of her books. RM: What does 2015 hold in store for Julie Montagu? JM: I’m actually really looking forward to this year. I like the sound of 2015! 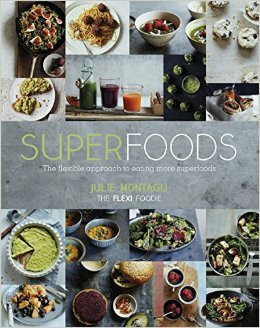 I have my first cookbook SUPERFOODS, published by Quadrille, hitting the book shelves on the 12th March. I just received investment for my superfood energy balls JUB and have hired 2 people to help with the re-launch of JUB, Ladies of London Season 2 will be premiering in the States and over here this year and I’m in the process of writing my second book on Healthy Eating.. and then there’s always my yoga classes which I truly love to teach – so it’s a lot to take on but all of these things I am so passionate about so it really doesn’t even feel like work! Royal Mums would like to thank Julie for taking her time to give us some advice and words of wisdom! If you would like to learn more about Julie then head over to her website for more information! Our top 10 things to do during February Half Term..